While deer behavior might be somewhat predictable, October in Ontario is a time of seasonal transition. Summer food become dry and unpalatable while nuts, berries and agricultural crops ripen, making them more palatable. Temperatures begin to drop and the wind increases, which pushes the deer towards more sheltered bedding areas. 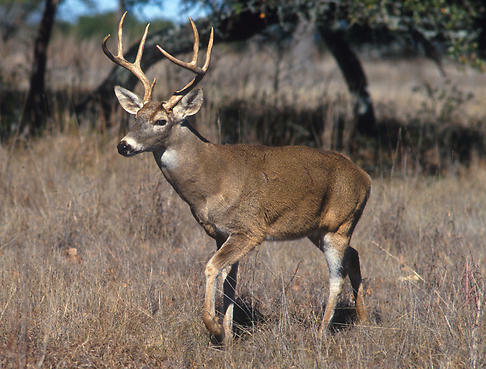 Because of these seasonal changes, a deer may change its home range. It may or may not use the same core bedding area, but it will almost certainly use different potion of the home range, especially for feeding. When picking a stand location, first determine the core area the deer are using to bed down during the day. Then figure out where the deer are eating, and which travel routes they use between the 2 area, both morning and evening. Since the changing season affects both suitability of daytime bedding areas and availability of forage, in October, you need to scout regularly to determine these things. Deer typically rest late at night and again during the middle of the day, and feeding mostly during the transition times from dark to light, then back again. During the day, they prefer to bed in heavy cover where they feel secure, and they usually don't leave these secure bedding areas (also known as core areas) until late afternoon, where they may move towards nighttime food sources in more open areas. The deer intermittently feed, travel and rest throughout a night, returning to their daytime bedding areas around sunrise the next morning. Because shade makes the deer feel secure, in forested areas they tend to move a little earlier as much as a couple hours before sundown. These are the spots to keep an eye on when whitetail bow hunting. They first move into areas of low brush or sparse forest where they may start to feed, and from there, they move on towards the more open fields and meadows. Early the next morning, usually before sunup, this movement pattern reverses itself, depending on available food, cover and the lay of the land. Most deer are back in their secure core area by mid-morning. Mature bucks tend to move about a half hour later in the evening and then a half hour earlier in the morning then the youngsters and the does. October is also when these deer start preparing for the rut. During early September, a buck may still hang out in bachelor groups with other bucks. But within weeks of shedding its velvet, it's testosterone level rises to the point it no longer tolerates other bucks. 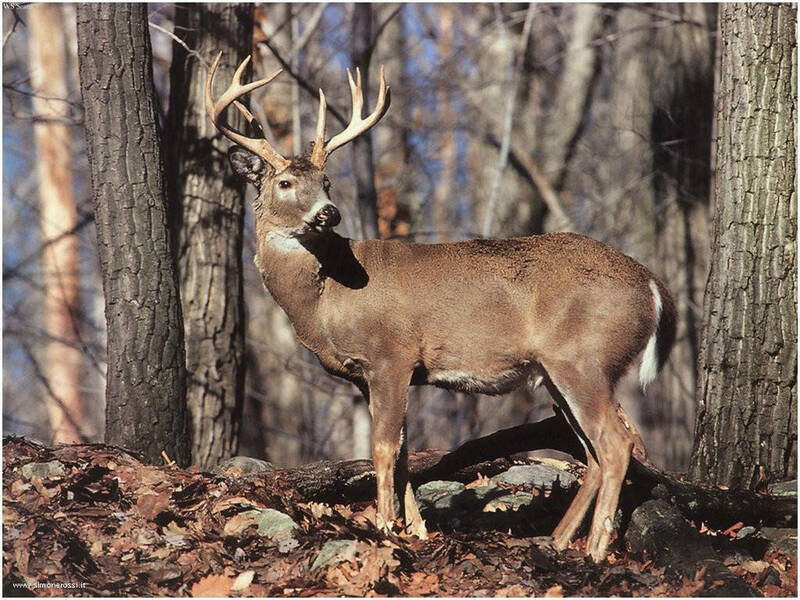 Older bucks tend to become quite solitary; they begin to move into and establish their fall breeding ranges. Above the 36th parallel, bucks tend to be on their fall breeding range two to three weeks before the peak of the rut. If the rut occurs early to mid-November, these territories may be marked and defended by mid-October. You can usually tell when a buck has established a fall breeding range by the appearance of fresh rubs and scrapes where none appeared earlier in the year. When you see new rubs and scrapes, begin watching to see which bucks have moved into the area and which bucks are traveling near the rubs and scrapes you've found, and what time of day they are near. You need to continue scouting, and you must be willing to move to better locations at a moments notice, this means hunting on the ground using natural cover or a portable blind, or hunting from a portable blind, or hunting from portable tree stands that can be moved quickly and quietly. You want to be able to hunt the same day you scout. Fresh doe sign may tell you where the bucks will be once the does come into estrus. And research shows that in many areas does start coming into estrus mid-October, even if the rut does not peak until November. When bow hunting, look for fresh rubs and scrapes along lightly used buck trails that parallel or bisect the more heavily used doe trails. No matter heavy the sign on the doe trails, set up on the less traveled buck trails if you want a buck. In October, I especially like to hunt along rub routes or near established scrapes that have been used three or more years in a row, especially in heavy cover or low-lying areas where bucks feel secure during daylight hours. If i am hunting in the afternoon, when the bucks are likely just leaving their core bedding ares in heavy cover, I set up along travel lane that leads to a somewhat protected area where the deer may feed securely while it's still light out. Good places to set up include beside openings in the wood, among oak trees dropping acorns, and along swamp or creek edges in deep cover. If I am hunting just before sundown, I may set up along a trail in tall grass, brush, swamp or gully that is a little less secluded. Trails in such cover downwind of more nighttime feeding fields can offer excellent stand sites, especially for bucks at sundown. If I plan on staying to hunt until full darkness, I may set up along a trail that leads directly into a feeding field. Just remember that the bucks move later than the does, preferring to stay in no cover until sundown. If you see does but no bucks, you may want to move deeper into the woods along the bucks travel routes. Early in the morning when deer are still feeding in the open, do not make the mistake of moving in too close before setting up. You may be positive there are no deer near by, you may think you can approach undetected. But in the predawn darkness, you probably wont know there's a deer there until it's too late, and if you spook one deer, It will alert all the others in the area. In the morning I usually set up in a transition zone or heavier cover, where I expect the deer to travel on their way back from a feeding area to a core bedding area, or I may hunt the trail leading into a core area. Regardless of where I set up, I try and be in the stand before the deer show up. Prior to bedding season, bucks usually return to cover well before daylight. Early in the morning, I may catch these bucks out along their rub routes in transition zones near the core bedding areas. Once the rut begins, bucks may return to their core areas much later in the day. When the rut is in full swing, it is not uncommon to see bucks dragging themselves back from chasing does as late as 11 o'clock in the morning. October is a time of transition in the deer woods, and you must continue scouting to keep up with the changes.